The Unity Candle is probably the most well known of the unification ceremonies, but not entirely practical at outdoor weddings or in venues that prohibit flames. In this ceremony, either the bride and groom may light their individual candles or representatives of their respective families may do so. While the officiant explains the symbolism of the ritual, the couple lights a central pillar using their two individual candles. The following are a few examples of unity candle rituals. The two outside candles _____ and ____ are lighting represent all they were, all they are and all they will ever be. They are two distinct lights, symbolizing not only the families that brought them to this moment, but also the two unique individuals entering into the sacred bond of matrimony. As they each take a candle and together light the center one, it now represents the coming together of two lives in a marriage relationship. As this one light cannot be divided, neither shall their union be divided. A marriage neither results in two distinct personalities, nor the complete surrender of individuals into a partnership. Rather it is a relationship that strengthens the individual through love, honor and respect. ________ and ________, the two outside candles burning here represent your lives at this moment. Each light is distinct, each able to go its separate way. ________ and ________ are two persons; unique, complex, individual human beings. And the same Creator who gave each of you your individuality and uniqueness is now giving you to each other. The mystery shall be fulfilled. The two shall become one flesh. From now on, what each of you have been individually, you will become together. What will touch your lives as individuals will become a part of a new unity. As each of you take a candle, carry the flame to the center candle, and extinguish the small candle, thus let the center fire represent the new unity being celebrated in this service. As the one center light cannot be divided, neither can your lives. May the one in whose name you are joined, who worked in your lives as individuals, continue to walk with you in your life together. The two outside candles have been lighted to represent both your lives in this moment. They are two distinct lights, each capable of going their separate ways. To bring bliss and happiness to your home, there must be the merging of these two lights into one light. From now on your thoughts shall be for each other rather than your individual selves. Your plans shall be mutual, your joys and sorrows shall be shared alike. 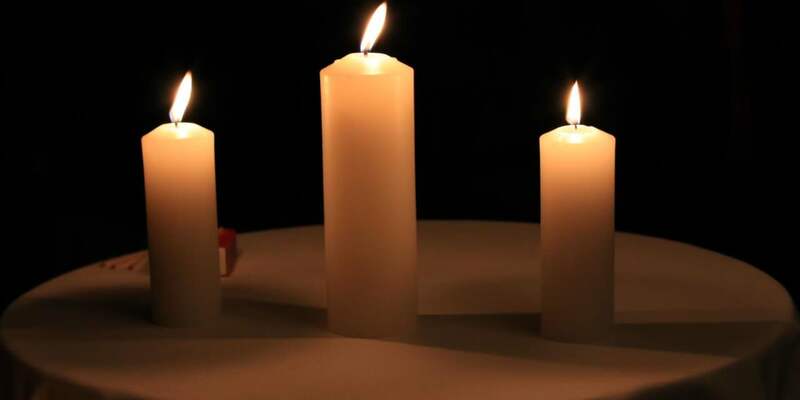 As you each take a candle and together light the center one, you will extinguish your own candles, thus letting the center candle represent the union of your lives into one flesh. As this one light cannot be divided, neither shall your lives be divided but a united testimony in your home. May the radiance of this one light be a testimony of your unity. One candle has been lit before and above all others, the candle which represents the presence of the divine in our lives. Together you will each take a candle and light it from the divinity candle. All that each of you have ever been, are now, or ever will be, is grounded in the presence of the divine. Together you will light the center candle from your separate lights, symbolizing that you bring your light, and the divine light to this marriage. All lights will remain lit as a testimony that divinity will shine through your marriage and through your own individual lives. Let your lights shine. The candles which ________ and ________ now light represents the coming together of their two lives in a marriage relationship. Their two individual candles continue burning. In the same way, ________ and ________ will continue to be two unique individuals in the midst of their marriage.